I played the first few minutes of Portal 2 yesterday in such a setting. Wow. This could be a great… comedy. The first Portal was clever and funny. It was a passive-aggressive first-person shooter. You had a gun, but you shot voids — one blue portal and one orange — usually with the intent of walking into one and out of the other, but sometimes with the intent of dropping an enemy gun turret into a Looney Tunes loop of falling into the floor, down from the ceiling, back into the floor, back out the ceiling, ad infinitum. You were ostensibly a test subject under the direction of GLaDOS, the sweetly-speaking, mostly-unseen robot who kind of seemed like she was trying to kill you. When the game wasn't making you think hard about how to arrange portals to get through the next test chamber, it may well have been making you laugh. 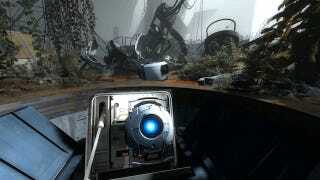 So starts the next Portal game, this spring's Portal 2, with dark, dark humor. In the game's single-player campaign, estimated by a representative from the game's development studio Valve to run six or eight hours, you are once again in control of Chell. In the first game she was, perhaps fitting with the theme, an empty character. Little in the opening of Portal 2 defines her sharply. She's you. But she's not the star. Right away, a robot named Wheatley is. Most of this beginning is on rails, It's essentially Portal 2's version of the scene-setting train ride in Half-Life. This is the set-up: You're in what looks like a hotel room that contains a bed, some small pieces of furniture. You're being given directions off-screen by a voice that tells you to do things like to look at a painting. "This is art," you're told. You are informed that it may relax you. And, if not, here's some classical music. (Note: humor isn't usually humor when it's retold, so I'm sparing you a recital of most of the intro jokes.) You're supposed to go to sleep, maybe wake up shortly, but instead you're waking up at some time much later — defined as "9 9 9 9 …." who-knows-what later by what sounds like a malfunctioning computer. The dent from your body on the room's bed is about a half-foot deep. Wheatley barges in. He's a spherical robot with a blue light for a face and the cheerful British star of Extras, Stephen Merchant, for a voice. He's little more helpful than GLaDOS was as he tries to help you chin up while exposing you to the fact that your room is both falling apart and one of many suspended in some huge chamber. We're still in Aperture Science's massive labs, same place as the first game, but much, much later. Metal is rusted, the place is wrecked, Wheatley's got our apartment on rails or something and is careening it through Aperture Science. Wheatley is either trying to help Chell or kill her. You can never be sure in a series like this, but he's telling good jokes. Most of this beginning is on rails, It's essentially Portal 2's version of the scene-setting train ride in Half-Life. It leads to more calamity and Chell eventually finding herself in what appears to be another version of the test room she was in at the start of the first game. There are reflections around. Line things up and you can see her. She looks healthy and as unspecific as ever. The "9 9 9 9" years (?) appear to have had little effect. In this later section, Wheatley was gone, but GLaDOS was serving the role of black-comedy provider. During an elevator ride between puzzles, for example, she was coolly explaining how you've been breathing the same recycled air, how you can't ever breathe fresh air (again, it's funnier if you hear it yourself and if I don't try to replicate the joke). She doesn't seem to have warmed to you in this game, though it's not clear if she's still trying to kill you nor if she minds that in the last game you tried to obliterate her. She is running the show, though. She doesn't just set up the puzzle rooms for you using verbal cues. She reassembles the room before your eyes. You see panels fly through the air and patch broken walls, architecture reassemble. Whatever destructive force there was that decayed Aperture Science is being undone. GLaDOS' magical reassembly of Aperture's labs is one of several graphical tricks in Portal 2 that delighted my eyes. This is still a series with an austere aesthetic. You're in lab rooms of white tiles and gray metal walls. Rust, dirt and maybe mold add a little color. Damage, however, is what adds the most visual variety. Panes of glass are shattered. Fallen beams add clutter. In the last game, graffiti told the story of unseen past events; in this game omnipresent ruin does. As well as the first game played and as masterfully as it was written, the first Portal won lifelong fans for its surprises. Its plot snuck up on you. It made a beloved character of a cube, gave personality to turret guns. It subverted itself by not being about what it appeared for most of its hours to be about. It ended, as few video games do, with a great song. (Songwriter Jonathan Coulton is returning for Portal 2 with multiple songs, probably placed though-out the game to better punctuate interesting moments, the Valve rep told me). If Portal 2 contains such unexpected pleasures, Valve is smartly hiding them — as they did for that first game. They're showing the polish in the expected areas, leaving us all to guess what could be newly special this time. Nevertheless, what they've shown looks confident and slick, and what I saw was just a hint of the half of it. The single-player campaign is separate from an equally-sized co-operative campaign that lets players control two robots and shoot a combined four portals. The Portal makers have earned our trust and are showing something that, so far, seems very good. We'll be able to play the whole thing when it's out on April 19 (PlayStation 3, PC, Mac, Xbox 360). It'll make us laugh, I'm sure of it, even if part of it is trying to kill us — in a fun way.